A Bompard Trophy like no other... - Skate-info-glace ! Thursday November 12 : All is quiet at Bordeaux-Mérignac airport. The sky is gray, dull gray, just like it was in the Alps where I live, and in Lyon from where I flew 50 minutes earlier. I briefly saw the sun, from my nr 17F seat, when the muzzle of the "bombardier" airplane broke through the clouds. What a strange name for a commercial aircraft. ("Bombardier" = bomber"). That was my thought when boarding, unable to foresee it would take a particular meaning the day after. My "chauffeur" is driving in circles on the parking lot while I retrieve my suitcase from a baggage carousel wrongly bearing the mention "arrival from Nantes and Paris". The 800 children who were invited to attend practice have already left Patinoire Meriadeck when I come in. The peaceful feeling of the rink is familiar to me, but also relative. I love the smell of dry ice, the sound of figure skating blades and the special atmosphere of discreet vibes, made of enthousiam and anticipation, that heralds competitions. Sitting behind me in the stands, a few members of the French team and their coaches watch the ladies performing their official routines. Nothing escapes their sharp observation. Their remarks, technical and precise, are accurate and objective. They would probably make better skating judges than some members of the official panel. The press room is half empty. Nestled in an attic of the second floor, it has obviously been designed as the artists' dressing-room, as shown by the brightly lit mirrors and dressing tables lined up along one of the walls. The arena, like Bercy, is also used as an auditorium. I pick up a spot in the shadow, at the other end of the room. Just like the athletes, we, media people, have entered our bubble, our own little world. The two next days will be lived in a vacuum, and at full speed. Faces seen are often the same, we meet again season after season, we smile and wave at one another, we exchange small talk. A short visit to the mall next door to buy mineral water, and Piper Gilles, dressed in a beautiful embroidered woolen coat, is waiting in line with an armfull of fruits. Making use of a diner downtown with friends, I try ducks' hearts for the first time and won't regret it. Despite heavy clouds, the tempertaure is mild and lots of people are walking around. We cross path with Igor Shpilband whose bag is full of the vinyl records he collects. He just bought a fresh load of them in a music store. Hard to sleep in an overheated hotel room. Especially when you are used to sleep with an open window all year round in the mountains... Probably to avoid water inside on rainy days (or suicidal dives, we are on floor 10), the window can only be left slightly ajar, blocked by a very short cable. Migraine headache is on its way. Friday November 13 : At breakfast, the restaurant is crowded. Other well known faces, judges, skaters, coaches, technicians, reporters, fans. Gracie Gold, her make up and her hair already done for her SP, enjoys a bowl of cereals. A young female fan, in awe, elbows her mother. Yes dear, skater eat, just like anybody else... I'm having a silent fight with a man from the Japanese TV crew. Which one of us will grab the last yoghurt available at the buffet table ? He does, he wins. The family of an Italian, gathered at a big round table, is discussing Cup of China with an American photographer sitting nearby. A scene of the every day life in the elegant and muted world of international events. The rink is only a few hundred meters away, only one street to cross. Fans have already settled on the front steps, flowers in one hand, cellophane wrapped food-in the other. A day at the Grand Prix is a long day, the food stand of the rink isn't offering much in terms of choice and it is everything but cheap. Always better to bring your own supplies. A concern shared by media people, whose presence has increased today. It has also increased compared to last year. 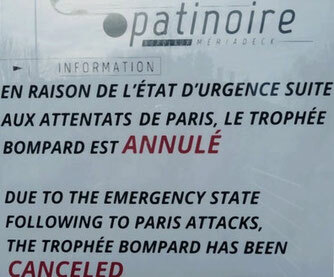 If, for the first exile of Bompard Trophy (due to works at the Palais Omnisports de Paris Bercy aka POPB), Bordeaux hadn't attracted lots of reporters, it seems that, this year, they have finally found the path to French south-west and Patinoire Meriadeck. The competition schedule is tight, the afternoon and the evening will go by quickly. Take note, attend press conferences after the programs, record the skaters' impressions, try not to miss a thing, start writing down while your own impressions are fresh in your mind. Thats is whata a day at a Grand Prix is like. We run a lot, the rest of the world is outside, beyond the walls. While the second group of ice dancers warm up for their ritual six minutes, I go out on the terrace to breath some fresh air. I'm surprised to see that night has already set in and that it is raining. In the artificial lights of the rink, with curtains closed on its high windows, keeping track of time is nearly impossible if you don't constantly keep an eye on your watch. Out of sync with the external world, the only calculation we make is in the range of a single minute : "how long before they start/skate again ? Enough time to grab coffee ? Or to get rid of the last one weighing on my bladder ?" The press room rustles of multi-lingual conversations. Tatjana Flade, in charge of ISU Communication, goes in turns from German to Russian, with a bit and even a lot of French, English and Chinese in the middle. All of it without batting an eye, without hesitation and without the slightest mistake I'm sure. A real phenomenon, who also speaks Japanese, Italian and Spanish if I'm not mistaken and/or if I don't forget anything. Photographers are busy emptying their SD cards before rushing to shoot another load. One of them is fighting over the phone with his wife, the entire room can hear of his gripes. People exchange potato chips, fruits, chocolate, cookies, soda cans, USB devices, restaurant coupons. Hurry, hurry, legal pad under my arm, don't forget anything, glasses, phone, pen, go back to the stands, the ones located behind the judges where the view over the ice is perfect. It is on the opposite side of the rink, we stride along walkaways and open floors, careful not to disturb skaters warming up off ice. Today, the competition has some suprises in stow for us. Elizaveta Tuktamysheva and Patrick Chan's below par performances, Vanessa and Morgan's excellent ranking, Roberta Rodeghiero's third place, Hubbell/Donohue ahead of Gilles/Poirier for less than a point. The day ends with the pairs' press conference. It's only, when, back in the press room, I'm packing my computer and bag , that, for the first time, I hear the words "shootout in Paris". Gunfires are quite uncommon in France, and to me, these words conjure up something like dealers settling scores. Certainly not mass murder. But, while leaving the rink, on the front steps I overhear people talking with security guards. "At least 15 casualties... a blood bath... several different terrorist attacks... Bataclan... Stade de France". Myriam - S.I.G. photographer, my fellow reporters from Passion Patinage, Michel and Ben, and I, have planned a late dinner in one of the nice restaurants of Square Pey Berland. It is only when we get inside Café Rohan, where the TV is on, that we can fully assess the extent of the disaster. A news channel is broadcasting the first images of the streets where the attacks were perpetrated in Paris. Police, special forces, fire brigades, sirens blaring, dismayed people with wild eyes. It is late in the evening, the restaurant is almost empty for the exception of the Italian team who arrived before us, and the waiters stand, frozen, in front of the screen, just as stunned as we are. My brother texts me to check where I am, as he knows the Bompard is usually held in Paris. Selfishly, I cannot help thinking that we are very lucky, since Bercy isn't far from some of the places that were attacked. But my friends are Parisians and Myriam's sister lives in Paris too. Like thousands or even millions of people tonight, they need to check where their relatives and friends are. 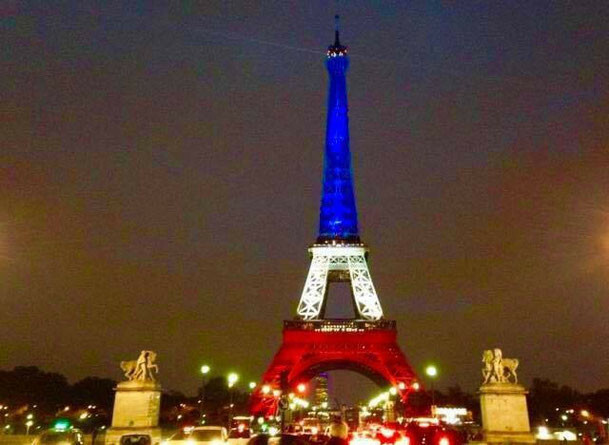 I know only a few people in Paris and social networks already informed me that they are all safe. Telling about the atmosphere of this dinner is difficult. We have been brutally thrown from our figure skating parallel world into an unsettling and nightmarish reality. Back to the hotel room that I share with Ben (we are close friends in every day life, he is my second "little brother"), our first move is to turn the TV on. The number of casulaties has dramatically increased, at least 89 persons lost their lives. I have a hard time wrapping my head around the tragedy and I cannot grasp the chronology of the events. Everything seem to have happened very far away from us. Or next door. Our hotel is located close to the main Bordeaux police precinct as well as a big fire station. Last year, we could already hear sirens periodically blaring. Tonight their ear-splitting complaint is particularly ominous. Because of the tight schedule of the competitions, I did not write much when I was at the rink. I am used to write easily and fast but suddenly, I find myself unable to put down readable sentences. I constantly glance at the TV to my right, to link images with the words my ears catch. Ben does the same, we cannot focus on our work and we end up putting the TV on mute. But its flickering lights are enough to distract us. At 3.30 a.m. I have only been able to write a mundane overview of the short programs, too largely inspired by the ISU reports I received by mail. At 4.00 a.m. I give up. Impossible for me to deliver anything better than this vague summary. Saturday November 14 : Ben went to the rink to attend practices. I choose to skip breakfast to catch up on sleep. I have as much success as I had with sleep a few hours ago, i.e. none. I turn the TV on again. The body count is still increasing, people are dying from their injuries. A mail from the ISU tells me the free programs will be normally held. Five minutes later, Ben texts me to tell me the contrary. Practice has been brought to a halt. I don't get it. I shower, I dress and I dash off to the rink. In the hall, the atmosphere is tense. A line of security guards bar me from entering. A lady frisks me, searches my pockets, my handbag, my computer bag. My first thought is : they will never be able to check every member of the audience before the competition, that starts at 1.30 p.m. There is not enough of them. There is not enough time. Europe on Ice photographer and reporter are right behind me. The three of us are escorted up the stairs to a conference room. Didier Gailhaguet just confirmed that Bompard was cancelled, a request from the prefect and the city Mayor Alain Juppé. Then he asked the attendance to sing the national anthem, la Marseillaise. It was a very moving moment, recorded on this video. Gailhaguet's voice is hoarse, I had never seen him with such a distraught face. 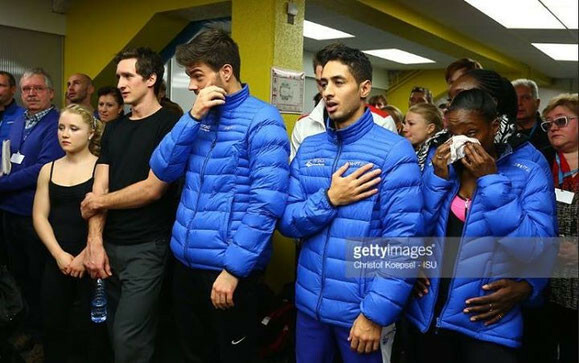 Most of French skaters, coaches and officials live in Paris and their family and friends witnessed the attacks almost live. They, too, must have spent many hours checking the whereabouts of their beloved ones. Two French ladies, usually very reserved and elegantly cold, have red eyes and mascara rivulets on their cheeks. Some people, men and women, are in tears. A few foreigners look worried. Later, on a social network, a photographer will mention that she couldn't leave France soon enough and it will make me shrug as, in her over-armed country, 30.000 people die by gunfire every year. But the words "bombing", "attacks", "mass murder" and the body count are indeed frightening. People exchange distressed glances. Is it because of the cancellation or because of last night attacks ? Probably both. It would be unfair for French athletes to compete when they may have been directly or indirectly impacted by the attacks (and when they will have to go back to a city bathed in blood). It wouldn't be fair either for foreigners to compete with additionnal stress weighing on their shoulders. The cancellation of the event was not decided, like I will read later on an international skating board, to show respect to the victims of the attacks, but essentially for security reasons. Most of gatherings and sport events scheduled on French ground are cancelled until further notice. The Meriadeck rink is situated in a large complex of buildings, offices and appartments, near a mall, with several hotels and right in front of the city public library, along a wide open avenue. On a Saturday, day off for many people, in a shopping area with a international sport event on top of everything, the entire district could become a target. Cancelling the Grand Prix is a logical measure, even if other public places (including the library) will remain open. In the crude white light of a TV camera, odd in such a moment, Maxim Trankov is recording an interview with Russian journalists, right in the middle of the room. His rather negative reaction, as the reaction of a few coaches and some of his contenders, will later harshly be criticized on skating forums. People have to understand that competition is their life. Such an event and the relevant cancellation of the Trophy have consequences for them. Of course, nothing that can compare to lost or wrecked lives. But, in the heat of the moment, some words can lack of sensitivity, words that some people and media are always too eager to report. To me, Maxim and Tatiana being disappointed was something understandable. Bompard was their first Grand Prix after a season (2014/2015) without competing. We eventually get to the press room which is already half empty. Around the ice, official banners, judges' tables and computers, TV cameras, everything relating to the competition, is being taken down. The FFSG press officer tells me that she lives in Paris, Rue de Charonne (where an attack was perpetrated) and that she will not be able to get back home as the whole district is off limits until further notice. I get out of the rink, and sit down on the front steps to talk with a few friends. Notices have been posted on the doors of the rink. Spectators are flocking in, they read the signs, incredulous, before striding around bent over their smartphones, texting their friends to spread the bad news. A Japanese lady is walking in circles, a huge bouquet of flowers in her arms, looking helpless. A small group of fans exchanges feelings with a few French skaters. A larger group is flooding the Novotel lobby, the hotel being home to most of the skaters and officials. The reception desk is swamped with people requesting changes in their transportation tickets. I doubt this is the best time to ask skaters for autographs and pictures. Especially if some fans' first idea is to tweet about those who supposedly are "fearful and coward". It sounds like an every-man-for-himself situation, like everybody is trying to escape something, when athletes are spurred on by a legitimate concern : finding a place to practice, the rink being closed. Most of the skating world will actually stay in Bordeaux, since the transportation schedules are hard to alter due to the state of emergency. My friends leave for a late lunch and I retreat to my room in the hope of much needed nap. Again, I'm kept awake by news gathered on TV and on the Internet. Our evening will be a little less tense than the night before. We are eight people tonight, dining in this same restaurant we visited yesterday (the Café Rohan). The full Italian team is there again, and the very cultivated and interesting journalist from Icenetwork, Jean-Christophe Berlot, will join us for dessert. Sunday November 15 : My flight back home is at 8.30 p.m. and I have to find a way to kill time. Busy chatting with Ben, I almost haven't slept at all. After breakfast, that we share with two friends we had had not time to meet until then (time really flies during Grand Prix), everybody go their own way. I choose to stroll around Bordeaux, a gorgeous city that I discovered thanks to Bompard, for I don't know if I'll have a chance to be back one day. It has been made official that the Trophy will return to Bercy POPB (that recently became Accor Hotel Arena) in 2016. I thought downtown would be very quiet and it is all the contrary. Pedestrian areas are crowded. With people and with policemen and soldiers fully armed. Surreal sight. The main stores of Rue Sainte Catherine are open, I come across two friends window shopping to kill time, just like me. Near Cours Pasteur, streets leading to the synagogue are blocked off by barriers and soldiers. One of them is a young woman, barely taller than her assault rifle. I cannot help thinking that she has the exact right built for a pair skater and I want to hug her just to thank her for being there. Do your job but do not get killed. Do not get killed everyone, no more, no one. I sit at the open terrace of a Café, in the sun of Place de la Victoire and check the social networks on my phone. On one of them, a fan lashes at Patrick Chan for having criticized the sudden cancellation of the Trophy. Strange, as I've heard, with my own ears, the Canadian saying the exact opposite. The worse may be the fact that the author of the post was present in Bordeaux. More than ever, there is a bottomless pit between whet I saw and what I read. I will never get used to it. Back to the hotel lobby where I wait for the taxi that will take me to the airport, I watch Japanese cameramen sorting out and packing their equipment. The Italian team is still there, a pile of shopping bags next to their seats. A French judge is watching TV and a German photographer is reading Die Welt. The attacks in Paris are all over the front page. Yesterday, I received a text from Air France asking me to be at the airport three hours before departure (for a 45 minutes flight...), since security controls and measures were heighten. I expected to wait in a long line and the airport is empty. I assume that a lot of people cancelled their trip. Soldiers are patrolling around, just like they were downtown. Among them, another tiny "pair skater" lady. Her long blond braids sticking out of her helmet and fluttering on her battledress make her look like a gracious fragile doll. At the checking counter next to me, Cheng Peng, Zhao Zhang and their coach are busy loading a mound of luggage on the conveyor belt. The smallest of their suitcase looks heavier than Miss Peng. I am all alone at the security gate where I am told that my flight will be one hour late. Fortunately, it will eventually leave on time and land ahead of schedule at Lyon Saint Exupery airport, as desert as Bordeaux Merignac was. And these ambulance lights, sirens, detonations, explosions coming to me through TV. Blood on pavement, on people. The distrubing fixity in the eyes of people who have witnessed the unthinkable. Of course, a figure skating competition is absolutely nothing in comparison to such a tragedy, such a murderous madness. But it is figure skating that brings us together on a regular basis, us, people from all horizons, athletes, coaches, officials, media people, pros or not, fans, simple spectators. We have a life away from this sport, other duties and other interests. And, maybe, only maybe, in Bordeaux, for once, we were, for a while, closer to one another than we usually are. Because the external world, with all its ugliness and cruelty, collided head-on with ours, in such a loud crash, that it forced us to talk. About us, about life, of something else than figure skating. That is what I will remember from this very special TEB.